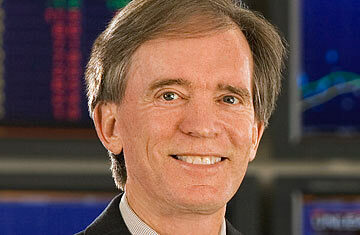 Bill Gross, cochief investment officer at Pacific Investment Management Co.
Should I Plan to Work in Retirement? The first half will be dominated by government stimulus and by inventory accumulation or a lack of [inventory] liquidation among businesses. I expect nothing from consumer [spending] and nothing really from housing or really any of the standard cyclical leading sectors. It's hard to put a number on GDP growth rates, but let's say 4% in the first half and then 2% in the second half, which would basically call for some additional help. Yes. Something else is probably needed if the [government's] thrust is really reducing unemployment below double digits and renormalizing the economy. All that said, I think they'll stop buying mortgage-agency securities, and the trillion-and-a-half-dollar check that's been written over the past nine to 12 months basically disappears. It's significant from the standpoint of interest rates and interest-rate spreads in certain sectors. And I would even go so far as to say it might be a mistake. Yes. I think the Fed wonders about this as well. But you have to understand that the Fed's probably under political pressure  such as the hearings for new regulation of the Fed, the growing public unease about the supersized Fed balance sheet, etc. The Fed's expanded balance sheet is not something that I consider to be a problem, but I think the market does  and so the Fed will probably be working in the direction of pulling some of the liquidity out of the marketplace. They won't sell  it's a near impossibility to unload what they've purchased over past 12 months. But they'll at least stop buying. I think it will. I mean, the mortgage market would be your first place to look, in terms of something that's overvalued that would become normalized. Nobody knows what the Fed's buying is worth  we think about half a percentage point on rates, but we don't know. But secondly, there's a ripple effect. Just speaking about Pimco's general portfolio strategy, we've sold our agency mortgage securities, Fannie and Freddie, in the billions to the willing check of the Fed. They're buying a trillion dollars of them, or have over the past nine to 12 months, and so we sold them a lot of ours. Now, what did we do with the money? We bought Treasuries, we bought corporate bonds, and so the bond markets in general have benefited, as have stocks, because this available money effectively flows through the capital markets. So it's a trillion-and-a-half-dollar check that won't be there as the Fed withdraws from the market. How that affects the markets, I just don't know. I'm not eagerly anticipating the answer, but I think it holds some surprises in 2010  not just in mortgage securities but stocks as well. We could miss the money, put it that way.